After a decade spent in Washington, D.C., the Armenian Assembly of America’s former Director of Communications, Taniel Shant, is now the Republican nominee for Palm Beach County Commission District 5, in South Florida. He is also the only Armenian to appear on the ballot in Florida. Taniel has spent his entire adult life in public service. One year after he moved to Washington, D.C. he found himself battling the Turkish Lobby and the Azerbaijani Lobby. He worked with our friends in Congress to hold the Bush and Obama Administrations accountable. Throughout his tenure, he advanced various pieces of legislation in Congress and at the state level dealing with Armenian Genocide recognition and Holocaust education, global human rights abuses, international religious freedom, anti-genocide initiatives (Darfur, Sudan; Syria; Iraq), protection of Christians in the Middle East, appropriations, U.S. foreign assistance, and many others. He holds a Bachelor’s degree in Political Science from Florida Atlantic University and a Master’s degree in Political Management from The George Washington University. Mr. Shant possesses an impressive pedigree – particularly when gazed at through the lens of the Armenian American community. Not only was Mr. Shant the founder of Florida Armenians, the largest statewide Armenian organization in Florida, but he successfully led the effort to pass a resolution in the Florida State Senate recognizing the Armenian Genocide in 2013. Armenian American political candidates have always been sparse – and too often, they have proved to be unviable. Mr. Shant’s first time candidacy, however, is proving itself as a force to be reckoned with, having raised over $40,000 in four month’s time – officially the most money ever raised by a Republican candidate in this seat. Mr. Shant is rapidly garnering the backing of Armenian communities throughout the country – Florida, New Jersey, New York, California, New Hampshire, Virginia, Maryland, Washington D.C., Georgia, Massachusetts, and more. Time after time, I’ve heard Armenians complain that U.S. leaders are not doing enough for Armenian issues, and that we need more Armenians in government. Today, I’m pleased to tell you that we have a tried and tested community leader stepping up to the stage for us, and for all the people in Palm Beach County. Taniel fought on Capitol Hill on behalf of the Armenian American community; and now the Armenian American community has a chance to have one of our own represent us as an elected official. It is time to let our actions speak louder than our words, and show him our support. If you would like to volunteer for Taniel Shant’s campaign, learn more about his platform, or make a contribution, please visit www.tanielshant.com or email info@tanielshant.com. 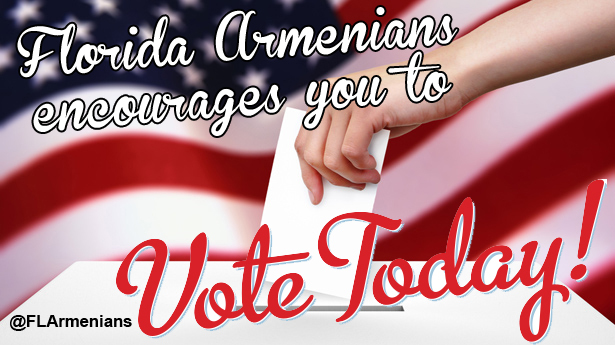 Florida Armenians highly encourages our officers, members, friends and supporters across the great State of Florida to exercise your democratic right and vote in today’s state party primary election. It is crucial that every Armenian American in Florida participate and, together, we can make our voices heard in both Tallahassee and Washington, D.C.